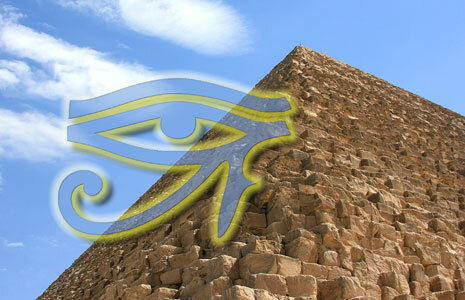 The following is the FINAL 12th and 13th message that we received in Egypt. (Yahoo) You can find our other messages on our website at www.alunajoy.com under the "Articles for Personal and Planetary Transformation" link. It might be a good idea to read them in order as each message builds upon the previous one. We are sharing this message here with you just as we received it, in present time, with very little editing. We do this for a very important reason. We know the messages that we receive are not just for our groups, but are for others as well. The Immortals, Horus, the Hathors, and other Star Masters and the Star Elders assure me that the message and the corresponding energy will be transmitted to you. So as you read this, you might want to imagine that you are with us. Also, always view the photos on the web site that we share, as photos also hold some energy of the sites. Inside the Kings chamber after about 1 hour of silence and meditation. Group member and our Maya Guide Enrique shares an opening prayer . . .
"Holy Gods and creator, we offer to you our prayers from our hearts, our best intentions, and we have come with honor and respect. I am very grateful for this privilege of being here. This is a great moment being in this sacred site, sharing these moments together. We come from the universe, and we left the seed stones. Moment by moment, we remain determined. We feel connected to you gods and goddesses of this great land. We are now in the core of this great Temple, and we can feel the energy that you offer to us. Thank you great lords and great ladies of this holy Temple for all the teachings, for all the energy and for all the love that you gave us on this pilgrimage, so we can take it to our lands to share with the people that haven't yet had the opportunity to come here. We respect the wisdom that you give to us as well as the abundance, the love and the heart. This is why we are here." Aluna shares . . . When we arrived here, there were two giant Horus' on top of the pyramid. They were huge! They are holding space for us in this light. When we sat down in the darkness of this temple, I could see waves of light coming in. Waves of light and little sparkle lights. And I asked what this meant. They said they are cracking open the door to the next world. It starts here. They said the work is done. We have done it. There is nothing else that needs to be done. We just have to live from the heart, moment to moment, and take steps forward. They say that the forward path has gained so much momentum now that there is nothing that can stop this shift. Just like it takes a little candle to light this whole temple, we are the candles of the new world. Three years ago, when we were here, it felt like we were beginning something. Now, it feels like we are completing it. It is such an entirely different vibration than the last time that I was here. I know that some of you have been here before too, but it feels complete. It feels like we are ready, equipped and prepared. The next step is the leap. They are cracking open the door between this world and the next one. It is coming down from the top of the pyramid all the way down into this chamber. It is a celebratory energy. We are celebrating. We are celebrating Egypt. We are celebrating our own liberation from an old world into a new one. I can feel Hathors coming in as a grand and loving send off, and it would be nice if we would send them a lot of gratitude, and give them thanks for this journey. They kept us safe, healthy and open to receive. They kept things flowing beautifully, and every site gave us so much that we can't even conceive how we are going to explain this to our friends and family when we get home. So we want to take this moment to thank all the guides, guardians and Angels in this very sacred moment. We want to thank all the Master and Gods that walked with us . . . The Hathors, Goddess Nut, Anubis, Horus . . . and Thoth is here also. Also to Akhenaton who gave us beautiful energy at the museum yesterday. We thank him for holding the vision of unity in a land that didn't hold that concept. I feel that he has passed this unity baton along to us for us to hold unity for the world ; unity in diversity. I want to thank all the people that were behind the scenes that helped us keep this pilgrimage going so beautifully in such volatile time. And to all the ones that we don't know their names; those who took care of our rooms, our food, who drove our bus, helped us cross the street and all the beautiful people we met. Thanks to all the ones who are celebrating and waved to us when we passed Tahrir square. We are so happy to be here with them celebrating the liberation of humanity. Also, thanks to the core of all that is, Father SUN and Mother EARTH, Pachamama, Pachakamaq, the Star Elders, the Ascended Masters, all the ones that have walked with us and have been with us in this life. We are so completely and totally grateful for this time, the wisdom and the enlightenment you have helped us obtain. Now as we enter the door into the new world, it is a door that we have earned collectively. We will never take this time for granted. We cannot conceive what it would be like in the world not to have the wisdom that we carry within us, without the light and the love. We can never take for granted what is to come, because we know how precious it is and how hard we all worked to arrive at this place. We know how hard all the light beings on this planet have worked to get to this place. The Star Elders have been telling me for over 20 years that we will be successful. This is the first day that I have actually felt this happening in my heart. We have arrived. It is something that I knew in my head for years, but today I feel it growing my heart. It feels complete. We have earned our paradise. So we are thankful, and we feel so much love for our experiences. Experiences we have had together, and experiences we had with each other in other ways. Even the beautiful times we have had in past lives. We know that the cornerstones of these beautiful experiences will come with us, and all that is not the vibration of the immerging new world will stay behind. I think that is why we are starting to feel this deep neutrality inside of us. This feeling that is beyond peace. It is a knowing that we are successful; that we have come to the end of the road, and the door is opening to a new one. What an honor it is to be alive at this time. What an incredible honor that we got to be in bodies at this time, and walked this Earth, and walked the sites again. We have touched them and felt their cornerstones. They are the seed stones . . . the heart of the heart. So, we just want to send our gratefulness to all the guardians at all the sacred sites that we have visited. So . . . I can see our gratefulness and our love going out across the world now. We are thankful. Outside of this Temple, I am seeing other guardians collecting what we have offered here, and they are now spreading this energy out across the sites we have visited, and the ones yet to be discovered. The seed that we were given during this pilgrimage has copied itself. It has split like a fertile egg. This seed is traveling to all kinds of sacred places all over the Earth. In this chamber, there is nothing in here but us. It is the purest place we could be to split our seeds and send them to other places in the world. With these seeds goes our blessings, our love, our joy and our gratefulness with honor, respect and integrity, as well as all things that we hold dear in our heart. These ideals are going out to the world now. We left the inner chamber and continued on to work between the paws of the Great Sphinx. The Sphinx is a watcher. He watches the world. He watches what is going on in the world, and he keeps the record of its history. That is why when people come here, they feel that there is a Hall of Records here, because he has been storing up records for eons. He/she watches and has the eyes to see. Remember when we kept asking "Just give us the next step, because we are blind, and we can't see what the next thing is because it is beyond our reach." 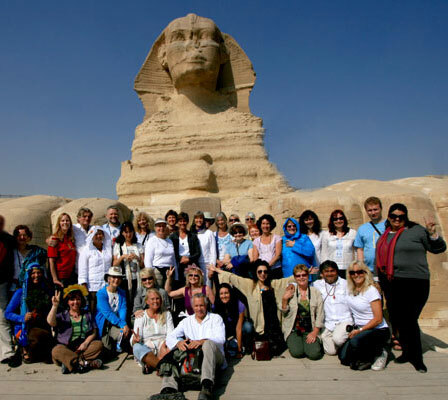 When we walked in between the paws of the Sphinx, I felt this download of energy, and I felt us being called back in like we had already been here. He is a watcher. He is a seer. But the way he is downloaded is by the initiates who come here. And the initiates are uploaded with updates to the human condition and state of evolution. Do you get what I am saying? So what the Sphinx holds is us. We are the energy of the Sphinx. We are the ones that have come here over the eons and offered our memories of what we had experienced and learned. We would download here, so we could keep a complete record of what was going on. Why would we need to do this? When we know what has taken place in the past, and we know where we are now, we can literally project forward to see where we are heading. Then we can make course corrections. Initiates, Masters and I expect even ETs, would come here and make course corrections in Earth's evolution. It is much like the movie "The Adjustment Bureau". So the Sphinx would collect information we would offer it, and then readjustments to the collective consciousness and evolutionary path would be made. These adjustments would go straight to source, the main 3 pyramids and to the creator of this site, which was not a human being like we are human, and course corrections would be made for the betterment of humanity. This would be done to keep humanity on a healthy course, while at the same time not impinge on anybody's free will. These adjustments were made on deep and subtle level of energetics and frequency; not physicality. They would just adjust the frequency, and then allow humanity to choose if they wanted to work with at frequency or not. So why is the world in such turmoil right now? The world is in such disarray, because, for a time, the initiates forgot to come here and offer their energy and insights. But you can see that this has been changing over that last couple of decades. We are turning this world around. It will take time, but the tides are turning. So we are the ones that deposited the Hall of Records here. I am sure that you all felt it when you walked in between the paws that there was a definite shift in frequency. It is definitely anchored here, but it was brought here by initiates over many, many ages. And this is a lot older than they could even guess. 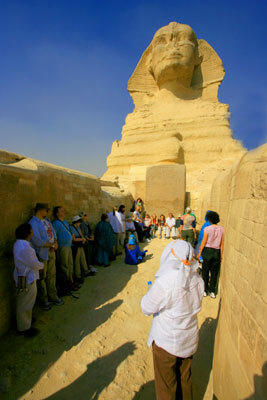 The Star Elders are saying "The Sphinx has had many facelifts", because it is really, really old. Group member Neil: Yes, so the information is this going back and forth. What I got was that I was seeing the Sun, and they were taking me into the Sun where it was all about creation. There I saw those four figures at Abu Simbel. You know the creators for the four direction. So today I feel it has come full circle. Group member Trish: So do you feel Thoth here? Aluna: I am not getting a name. I am just feeling the presence of the Sphinx itself which is more of a collective of who we are, and it has been built up over time. But there is an actual Sphinx entity that is here, and he/she is watching us now. Also, a strange thing is I feel that there was another Sphinx; a mirror image of this one somewhere in the world. 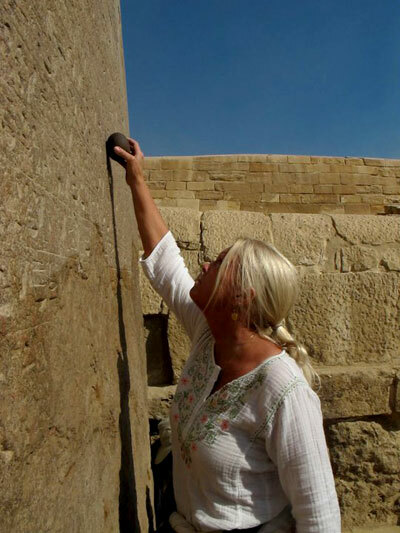 Group member Trish: There is a blue Sphinx somewhere in the Americas. I don't know where. Aluna: That is where the adjustments, that they are talking about, take place. The adjustments are in pure energy. These are adjustments in frequency that we (light workers of the world) are here to make. When we were in the King's Chamber it was very different . . . Even audibly, it was different. I noticed it immediately when we walked in. Because the first time I was there, any little sound that we made echoed so bad we could not hear it. That was until we sang, and then it became melodious and harmonious. This time I expected the same effect, but it was very different. We could talk to each other. We could HEAR! I thought "Why is this different? Nothing in this chamber has changed." And then I realized that WE have changed. We have come more in harmony with the frequency that is in that chamber, so we can interact with each other and work together. So when we were told we had arrived, the outer proof of this was that we could talk to each other, and it didn't go into this discordant energy. We have evolved and can now actually merge and work with this chamber by sharing back and forth without the energy going crazy. This is why we feel so complete. I think that we have completed a very big task, and now a new job is ahead of us. We have made some adjustments to the frequency just by being who we are. So it was perfect that came here immediately after the King's Chamber, so we could anchor the adjustments here. Then the Sphinx sends all the adjustments out into the world and to the other mirror Sphinx. Group member Kerrie: I received a symbol. This symbol started with a circle, and it moved to the infinity sign, and the circle became an eye. They eye was in the center of the infinity symbol. Aluna: Oh . . . Thank you Kerrie. You triggered something. The Sphinx has one thing, he would like to do with us, and that is to anchor an infinity symbol inside of us. It is in multiple layers and works like a gyroscope. This will exist between us and the Sphinx from now on. If you are okay with this idea, we can link this. This will also link us to the mirror image Sphinx in South America; or maybe in the Maya lands. I feel it is in some jungle somewhere completely covered up. But we will also become a mirror image Sphinx for this Sphinx in the outside world. We are going to anchor this so we can continue to made adjustments as the world evolves and changes. We will be his eyes to see. We are going to be a part of the Sphinx on the outside. So no matter where we go, we will be able to download things back to here, and receive what has been anchored here back to us. So if it is Okay with you, they would like to anchor this cosmic infinity inside our seed. The Star Elders popped in and said that it is like a cosmic super highway of information between us and the Sphinx. It is a cosmic high speed internet. We are going to ask that this cosmic infinity circuit be anchored within us, through all time, space, dimension, past, present, future, body, mind, spirit, 7 days a week, 24 hours a day, 365 days a year, until we decide that we no longer need this connection. We can break it at any time. It is yours to do with as you wish. It has been given to you, because you have the quality of heart and pure intent for creating a new and better world. So when we leave here today, we won't lose our connection to the Sphinx or the King's Chamber. The wisdom of all the ancients, of all the seers and of all the enlightened ones anchored their energy here along with us. It is a huge library that is not anchored in technology but experience. It will help us be discerning and choose the right decisions. In this new energy, a lot of things will come up that we won't understand, because it is brand new. We will have to pull on wisdom of the collective and the ancients to be able to understand what choices to make. The odd thing is that the information that is here won't tell us what to do. But it will be a frequency that will get us clear, so we will know what to do next. What we are doing next is up to us. What the ancients did is the way they did it. The way we do it now will be different. But the frequency, and the way things are stored here, will help us trigger an understanding of how to operate now, so we don't just repeat what we did in the past. Does that make sense? So this knowledge is not like a book or something you read. It is a frequency that comes from the hearts of all those that have worked with this place, and it will help trigger a knowingness in us in which we will understand how to work in the present moment. The past is the past, and old rules and laws are changing right before our eyes. Some of the laws of nature that hold this dimension together have begun to shift. So we will run into situations where we will have to pull from a higher place inside of us in order to know how to react to situations. We won't be able to react anymore like we had in the past. Have you noticed how neutral we have become? It almost feels detached. We will have to BE in this space so we don't react. It is a new form of Response-Ability. We need to act, not re-act, in appropriate ways based on the new energies. Just by the mere fact that we came here during a liberation/revolution is a big clue that thing are changing. We had to pass a test before we could take this next step. We passed the test by listening to our hearts, and not our fear. This is why this Sphinx is allowing us to connect in this way . . . and others that follow us that come from the heart . . . and the ones that were here before us. So now we are official members of a cosmic and ancient Adjustment Bureau.